1. The 1928 Wedgewood stove looks small, but the oven is large enough for a turkey. It came from Buckeye Appliance in Stockton. 2. The under-sink cabinet features a trompe l’oeil cutout, with the bottom portion of the doors painted black to mimic a skirt. 3. The flooring is a linoleum product called Marmoleum. Made with linseed oil and wood shavings, linoleum was popular in the 1920s. 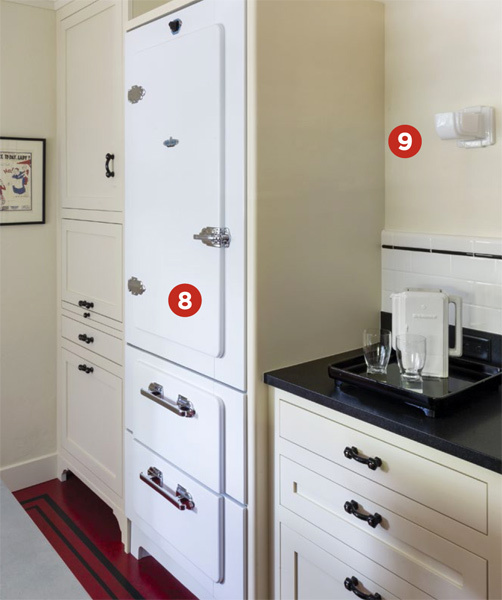 The homeowner was nervous about the idea of a red floor, so Kakies mocked up a sample using sheets of red poster board with a black inlay—and she was sold. 4. To create the custom cream color for the walls, trim and cabinets, Kakies used an original Dutch Boy paint deck from the 1920s. 5. Kakies designed the island to look like an old-fashioned farm table, with a beadboard pie safe underneath. The top is made of zinc (very period appropriate) and the legs are quarter-sawn oak that were ebonized using a recipe from a 19th-century cabinetmaker. The 1928 Wedgewood stove looks small, but the oven is large enough for a turkey. It came from Buckeye Appliance in Stockton. The under-sink cabinet features a trompe l’oeil cutout, with the bottom portion of the doors painted black to mimic a skirt. The flooring is a linoleum product called Marmoleum. Made with linseed oil and wood shavings, linoleum was popular in the 1920s. 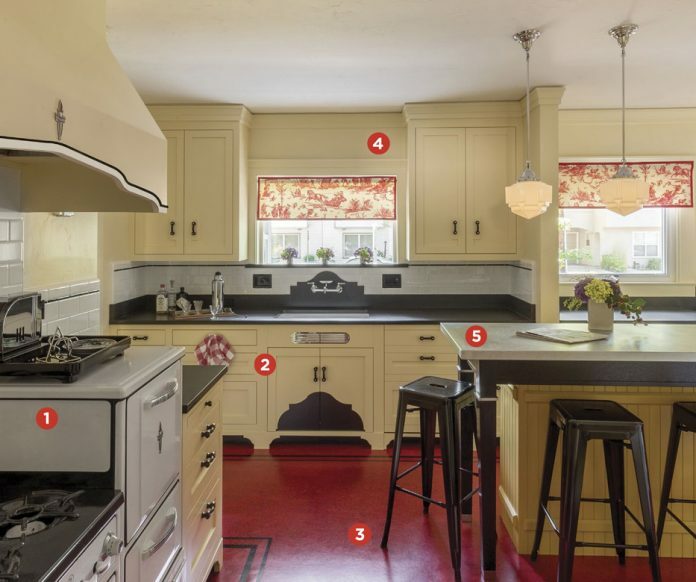 The homeowner was nervous about the idea of a red floor, so Kakies mocked up a sample using sheets of red poster board with a black inlay—and she was sold. To create the custom cream color for the walls, trim and cabinets, Kakies used an original Dutch Boy paint deck from the 1920s. Kakies designed the island to look like an old-fashioned farm table, with a beadboard pie safe underneath. The top is made of zinc (very period appropriate) and the legs are quarter-sawn oak that were ebonized using a recipe from a 19th-century cabinetmaker. 1. The 1928 Wedgewood stove looks small, but the oven is large enough for a turkey. It came from Buckeye Appliance in Stockton. 2. The under-sink cabinet features a trompe l’oeil cutout, with the bottom portion of the doors painted black to mimic a skirt. 3. The flooring is a linoleum product called Marmoleum. Made with linseed oil and wood shavings, linoleum was popular in the 1920s. The homeowner was nervous about the idea of a red floor, so Kakies mocked up a sample using sheets of red poster board with a black inlay—and she was sold. 4. To create the custom cream color for the walls, trim and cabinets, Kakies used an original Dutch Boy paint deck from the 1920s. 5. Kakies designed the island to look like an old-fashioned farm table, with a beadboard pie safe underneath. The top is made of zinc (very period appropriate) and the legs are quarter-sawn oak that were ebonized using a recipe from a 19th-century cabinetmaker. The living room, with its Roche Bobois sofas and iconic Womb Chair by Eero Saarinen, provides a serene setting for this busy family to relax together. 6. Local company Strom Plumbing made the wall-mounted faucets, which are copies of an American Standard faucet from the late ’20s. 7. 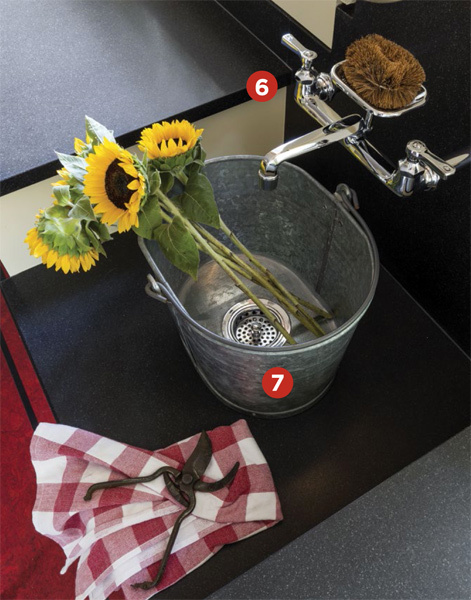 In the laundry area, Kakies repurposed an old galvanized pail as a utility sink. Hanging above the sink: a pair of framed photos of Blunden’s husband, Tom Marx, as a child bathing in a galvanized laundry tub. 9. Original art-deco wall sconces came from a hotel in the Midwest.